Although the tinfoil phonograph attracted a great deal of attention when it was first shown to the public at the end of 1877, very few related materials have survived. 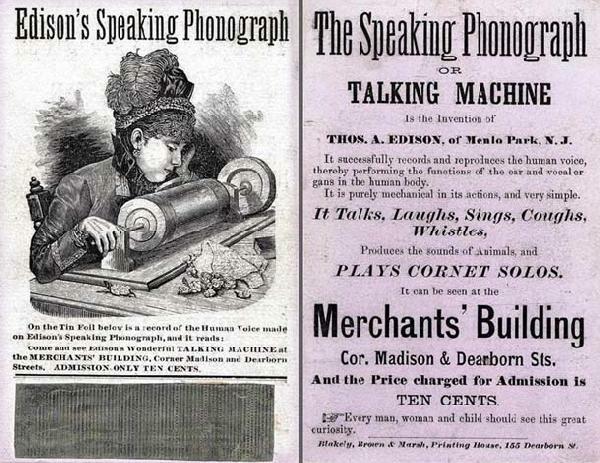 Paper items such as trade cards and handbills offer unique insight into the marketing the phonograph in its infancy, however, these "ephemeral" items were never intended to last and are very hard to find today. 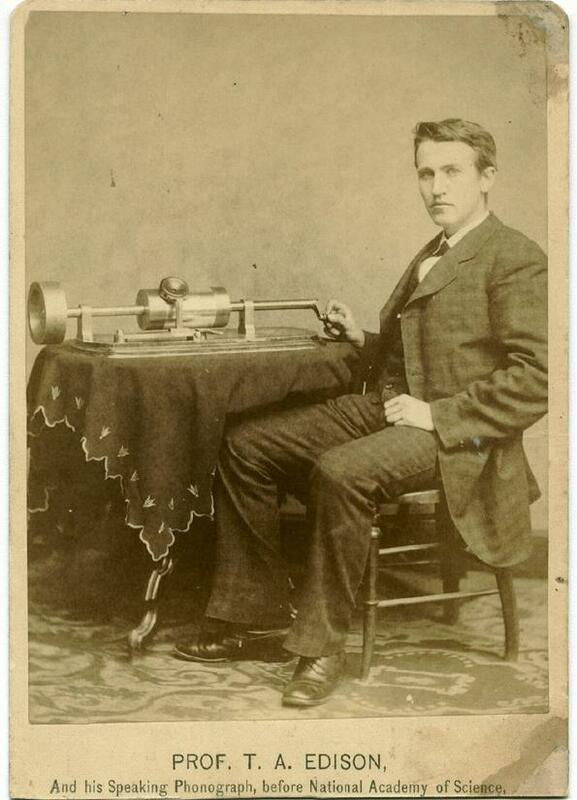 Prior to the invention of the phonograph in December 1877, Thomas Edison was virtually unknown among the general public. 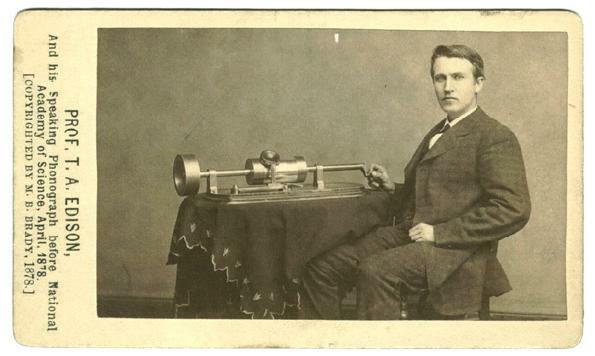 It was the tinfoil phonograph that made Edison an instant celebrity. This was a new and heady experience for the young (30 years old) inventor. It is perhaps no coincidence that Edison started signing his name in a more flamboyant manner only after he became famous that December, adding an "umbrella" paraph to what had been a very ordinary signature. He retained the umbrella motif for the rest of his life, and even trademarked his autograph in the 1890s. 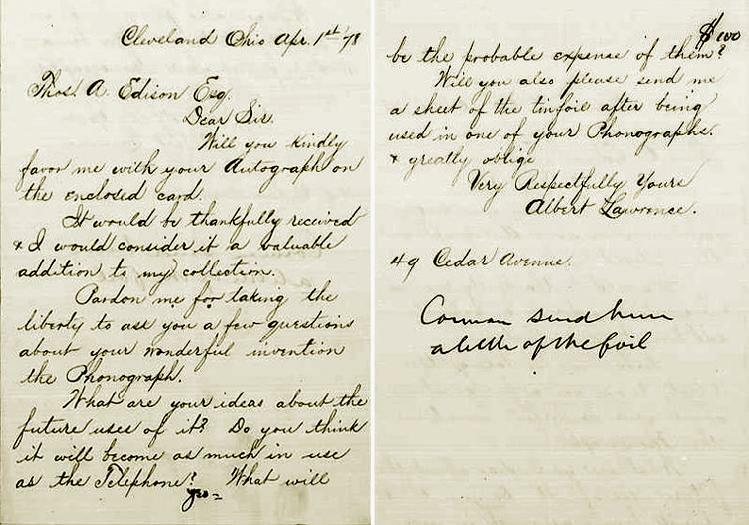 Amazingly, the original request sent to Edison by his Ohio fan still exists, in the archives of the Edison National Historic Site (see copy below). 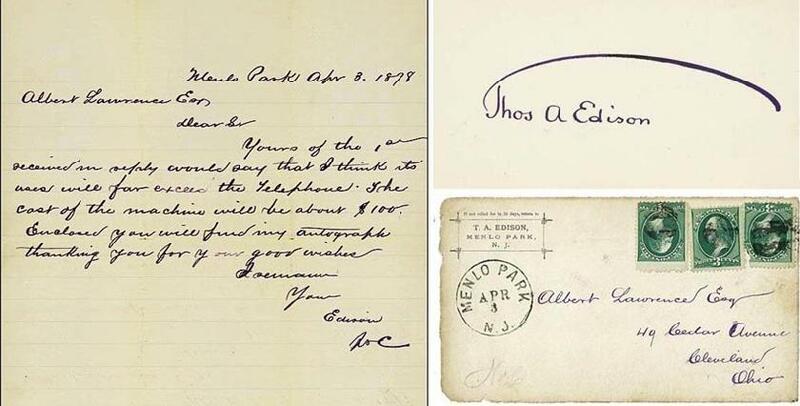 Edison jotted a note on the letter instructing Carman to "send him a little of the foil." Alas that this very early piece of recorded tinfoil is no longer in the original envelope with Edison's letter and autograph! On April 18, 1878, Edison took his second model of tinfoil phonograph to Washington D.C. to present to the Academy of Sciences. On the following day he went to the studios of famed Civil War photographer Mathew Brady to have his portrait taken. 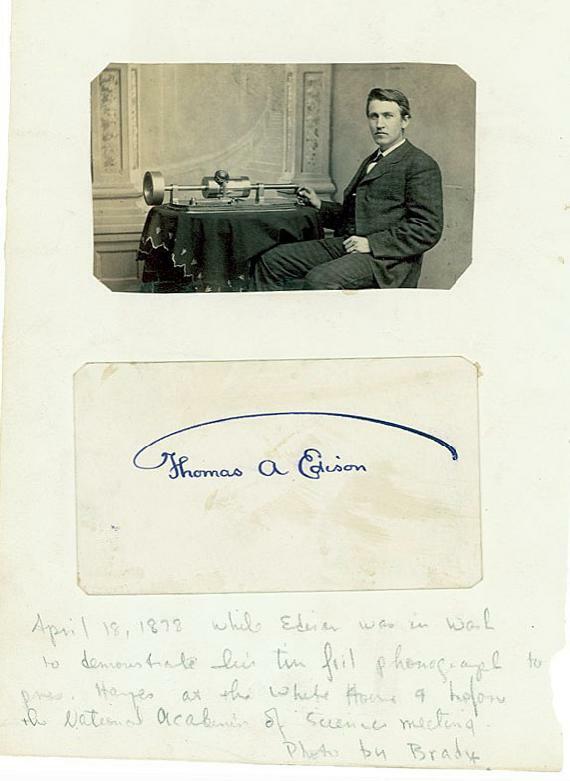 These pictures were then sold to the public in either vertical "Cabinet Card" as seen above (about 4-1/2" by 6-1/2" or horizontal "Carte de Visite" format (about 4" by 2-1/2") shown below. Edison agreed not to pose for any other photographs for a period of time after the sitting so that Brady could have a monopoly on sales of Edison's image. It is not generally known that there were approximately 15 different versions of this famous Edison photograph taken during his visit to Brady studios. Two different backgrounds were used -- plain, as seen in the first two photographs above, or painted backdrop as seen on the autograph album page below. Even among photographs with the same background there are subtle but obvious differences among the various pictures as can be noted by comparing the folds in his jacket in the different images. 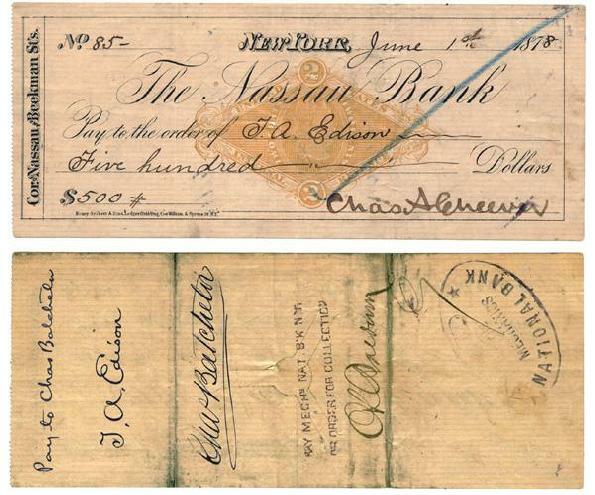 This check was issued by the Edison Speaking Phonograph Co. in payment of monthly royalties owed to Edison for his share of phonograph exhibition income. It was issued and signed June 1, 1878 by Charles Cheever, a major investor in the Speaking Phonograph Company and the company's treasurer at the time. On the back, Edison has endorsed the check over to his assistant, Charles Batchelor, who was Edison's right-hand man in the Menlo Park lab. Most of the improvements made to the tinfoil phonograph in 1878 were Batchelor's inventions. While Edison took credit for his employees' inventive work, he was generous in compensating key people like Batchelor. This trade card was used to promote phonograph exhibitions in Chicago in 1878. (Such "trade cards" were a very popular form of advertising in that era.) The exhibitor found a clever way to use old sheets of recorded foil left over from earlier demonstrations -- he cut up them up and glued a small 3" by 1" scrap to the front of the card. The recorded indentations are intact and easily seen. Though it is obviously unplayable, it remains one of the very few surviving pieces of recorded tinfoil in existence. 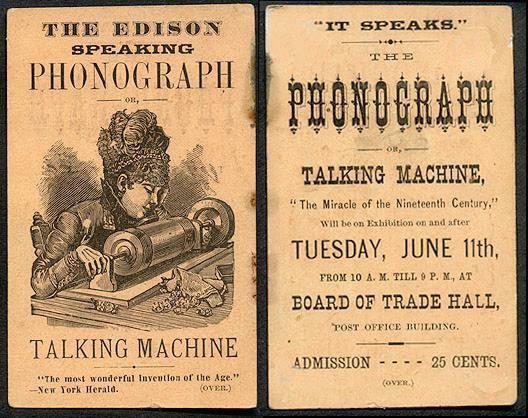 Another early trade card advertises phonograph exhibitions starting June 11, 1878, in an unnamed city. This is smaller than the previous card, measuring only 2-1/2" by 4".